If you picked up Sir Richard Branson’s “Business Stripped Bare: Adventures of a Global Entrepreneur” expecting to read the inside story of his sprawling business empire, an empire that reaches across multiple continents, industries and, if he has his way, planets, you will be disappointed. That’s not the “bare” that Branson is “stripping. Instead, Branson is talking about his theory of business and how it can apply to yours. The idea that even if you’re running something as large as he is (or was, Branson’s not really running anything any more, except his private charitable organizations), it doesn’t have to be elaborate and complicated and alienating. It can – indeed should – be very simple. To be clear, Branson acknowledges that “simple” and “easy” are not the same thing. But a business, he believes, that is operated along some very simple precepts is, in the long run a more successful, efficient and effective one. And it’s hard to argue with the success of a man who launched a company selling cut-rate records in college and who now has a net worth estimated at over four billion bucks. To make his case, Branson touches on all the key topics an entrepreneur is likely to need to manage – People, Brand, Innovation, Leadership, and his personal favorite, Social Responsibility. His direction is generally as straight-forward and iconoclastic as you would expect. Like Branson’s advice on people – “Find good people and set them free”. Or said another way, learn what you know and learn what you don’t know, understand what you do and what you can’t do, then hire people who fill in your gaps. And then, let them do it. Don’t try to do what you don’t know how to do and don’t try to force other people who can do things you can’t do to be versions of yourself. Branson’s history is full of people has hired whom he readily admits are experts in areas of his empire that he is not. This is a good thing. It is something to emulate. And don’t be afraid of making mistakes. Sure, easy for Mr – or rather SIR – Richard Branson to say, right? And yes, the big mistakes are, one would assume, well in his rearview mirror. But the attitude that it’s better to try and fail than not to try at all is palpable. From being caught red-handed in 1969 illegally bringing records into England (which cost him £60,000 and took three years to pay off) to some of the whimsical and arbitrary phone calls and decisions he’s made that he and his staff are still scratching their heads about, it’s a mindset, an approach. And it’s why there’s a whole chapter dedicated to it. Or his thoughts on innovation which also take up a whole chapter, and which on one level are essentially “Always keep your ears and eyes open” but which resist the odor of the obvious with examples Branson uses from his own companies. Like when he began developing Virgin Atlantic, he challenged his crew with nothing less than creating a travel experience that was different from anything else U.S. travelers had experienced. Something, as Branson puts it that would “knock their socks off.” This led to questions like “What if we got rid of check-in lines? How can we give control back to the passengers” and others – the kinds of questions that came, not from Branson, per se, but from the kind of people he hired who were just as dedicated to innovation as he is. Which points out one of the challenges of the book. For all the theory and abstract business principles, one finds oneself glossing over them to focus on the more compelling and more vivid real life story of Virgin that Mr. Branson sprinkles throughout the text. Partnering with Google to create a community on Mars in the next 15 years, hanging out on his own private island in the Caribbean, and making a bid to buy the biggest banks in England to save the British economy can’t help but overshadow straightforward business advice, no matter how successful it has proven to be. Which is a shame, actually. Because there’s a lot here that a lot of companies could learn from. A lot here that would give them permission to become the kind of companies they only dream of becoming. That would allow their people to become the kind of employees who could help get them there. 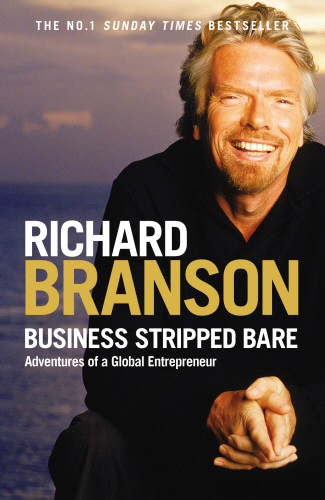 Business Stripped Bare: Adventures of a Global Entrepreneur by Richard Branson was published by Portfolio/Penguin on 4/26/11 – order it from Amazon here or from Barnes & Noble here – or pick it up at your local bookseller (find one here). the job of a company is in direct relation to the job of a healthy and balanced family; to bring about more life, sustain it, and help the next generation aspire to even more greatness. if the opposite is true – something i have a feeling is the current state of families, companies, and society – then we are doing everything in our lives out of selfishness. this is contra-natura to our souls, our natural intentions and against everything we profess we learn in any religion (another form of organization that mimics the family and company). be careful of the “company you keep”, as in the people who surround you and the products you purchase. or, better yet, do everything in love and not out of fear. fear reduces life to death. beware of companies selling wellness, they are actually exposing their weakness and their wholly transactional intentions. O, how i wish for a little more light in our craft, there is nothing wrong in profiting from our truly true intentions. people might be blind but their minds always know the difference between manipulation and delight.